From left: Brittney Reed, Emma Vanderhyden, Anthony Lew, Marcus Gonzalez. Brittney Reed is this week's honoree from the girls basketball team. She was MVP of the Chino Hills Tournament, which the Broncos won in December. She has also led her team to a 14-2 record and No. 8 ranking in the CIF Southern Section Division IAA poll. Girls soccer player Emma Vanderhyden had three goals and an assist over the break to help the Broncos to an 13-2-3 start. The junior forward is also attracting interest from college programs. She has seven goals and five assists this season. Anthony Lew was the team's leading scorer for the boys soccer team with three goals during tournament play over the holiday break. He has six goals this season. Senior forward Marcus Gonzalez has performed consistently for the boys basketball team, which is 9-8 overall and 1-1 in league play after a 59-50 win over Murrieta Valley on Thursday. 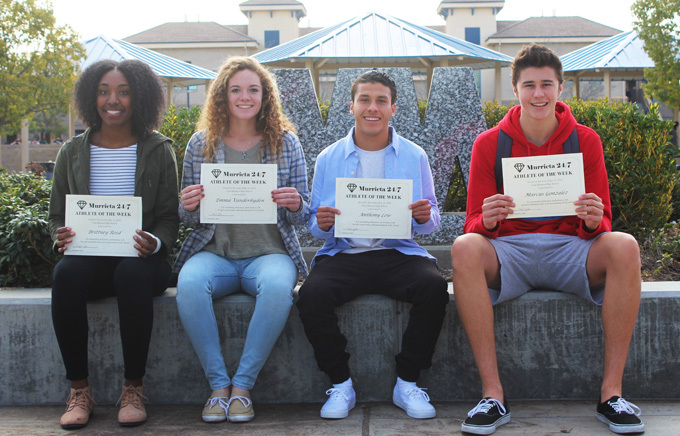 These athletes will be eligible for selection as Vista Murrieta's January Athletes of the Month. Anyone wishing to order a glossy print of this article with photo may do so by emailing murrieta247info@gmail.com.